You can get Free Coupons by Mail no surveys and/or Free Manufacturer Coupons that you can print directly from Food/Grocery and other Manufacturer's sites. Here's how: Simply write to them via email, contact form, or postal mail complimenting their product and telling them how much you, your kid, your spouse, or anyone in your household loves their product (be sure to provide details regarding the product, such as: name, brand, product #, model #, or flavor). Then ask if they can send you any coupons for free products and/or any discount coupons. More often than not, they will! Usually they will either send one coupon for a free product, or they will send multiple high value discount coupons (such as $1.00 to $3.00 off). It's a great way to get high value free coupons by mail and the manufacturers love to hear the great feedback about their products. 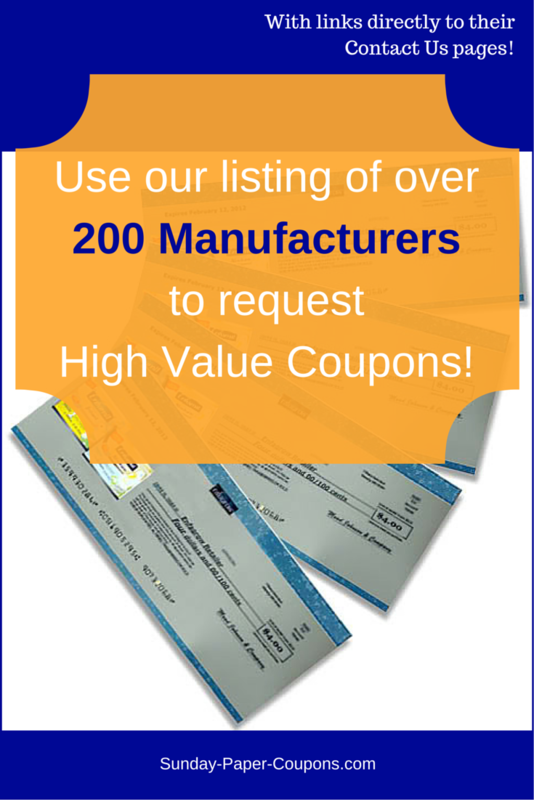 Also, many product and food manufacturer’s offer free manufacturer coupons right on their own websites. If you're interested, while you're on their sites, you can also access their Recipes, Contests and Sweepstakes!